Honestly, I think I’ve needed a book like this for a while. I still have a warm feeling in my heart! Oh my god, this was so funny. I don’t usually laugh out loud when I read books. Sure I smile and shake my head but really laughing out loud? Note for future readers: don’t listen to this as an audiobook and walk outside in the park if you’re worried about people looking at you weird when you laugh. Audrey’s family dynamic was so great to read about. Her mom is literally the best and the funniest, she made me laugh so much! The best parts of this book for me were the “My Serene and Loving Family” transcripts! Also: Loved Dr. Sarah! I’m so sick and tired of mental health care professionals being bashed in YA! Usually, the main character will act like they’re too good for getting treatment done, and it’s so annoying how many authors that show mental health care practitioners as “nosy” or “philosophical” and “just a shrink I go to to make my parents happy because this is a waste of time”. 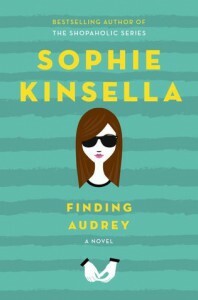 Thank you, Sophie Kinsella, for showing that Dr. Sarah and Audrey actually do have a good relationship as a doctor and patient. Obviously Audrey goes through a lot of self-finding through this book and I’m proud of her and every single character in this book. I just wish the “event” that happened was revealed because it felt like so much was building up and then nothing was revealed.